What is it that made Starbucks an overnight sensation and separated it from other coffee house companies? Why do many products with great product innovation, perfect locations, terrific customer experiences, even breakthrough advertising fail to get the same visceral traction in the marketplace as brands like Apple and Nike? Patrick Hanlon, senior advertising executive and founder of Thinktopia, decided to find the answers. His search revealed seven definable assets that together construct the belief system that lies behind every successful brand, whether it's a product, service, city, personality, social cause, or movement. 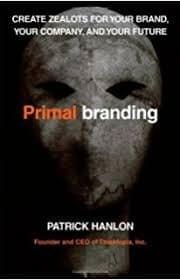 In Primal Branding, Hanlon explores those seven components, known as the primal code, and shows how to use and combine them to create a community of believers in which the consumer develops a powerful emotional attachment to the brand. These techniques, work for everyone involved in creating and selling an image-from marketing managers to social advocates to business leaders seeking to increase customer preference for new or existing products. Primal Branding presents a world of new possibility for marketers of every stripe-and the opportunity to move from being just another product on the shelf to becoming a desired and necessary part of the culture.